A world-class kitesurfing spot, Paje is wilder than European kite destinations. Large white sandy beaches, crystalline water and white sand, it is one of the most beautiful beaches in the world. Less touristy than the North of the island, yet animated and interesting – it is the perfect spot if you are looking for a peaceful yet active escape. Thanks to its steady sideshore winds and sandy spot, Paje is the best area on the island if you are interested in practicing water sports like windsurfing or kite surfing. Also on/near the spot: snorkeling, swimming, swimming with dolphins, Jozani Forest and its red Colobus monkeys, Spa, Tour of Stone Town (UNESCO Heritage site). We organize transfers – please contact us for more information. Protected by a coral reef 2 km. in, the spot offers the perfect mixture between a large flat water lagoon to learn and practice kitesurfing as well as waves beyond the coral reef. 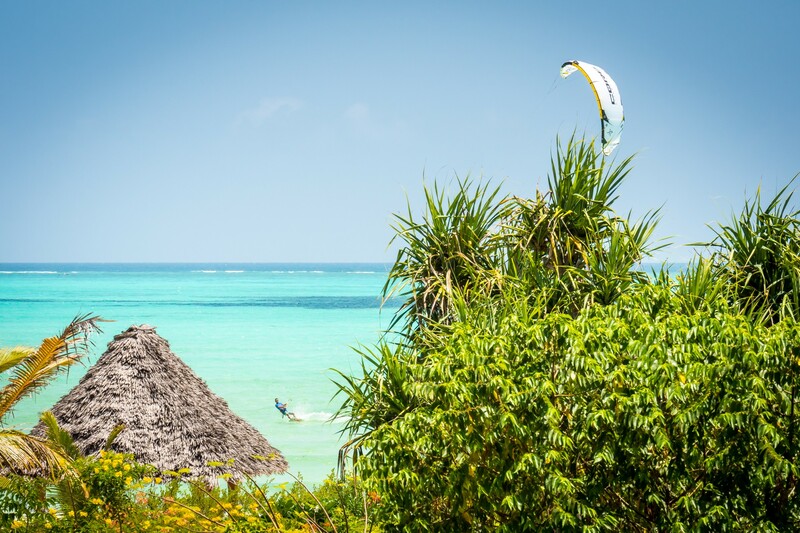 Zanzibar Kite Paradise aims to offer you a blissful experience in a safe environment. One kilometer away from Paje village and its kitesurfing crowds, we are located in a quiet stretch of beach which offers a large private space for learning and riding. In our lessons, we priviledge an individual approach with a maximum of 2 students per instructor. We also have a rescue boat on standby. The windy season is split into two: mid December to February, which is known as the Kaskazi, this blows from the North at around 12-25 knots, most days between 15-18knots. The Kuzi blows from the South to SE from May to October, but can start in April. The Kuzi is the stronger of the two and blows most days between 12-25 knots but averages between 15-18 knots. Calmer in the morning and gets stronger normally after lunch. Best months are July, August and September where you can expect excellent wind most days.